What reveals your age? - Amirite? - Post your opinion and see who agrees. The words and phrases we use. Knowing the origin of an idiom can really date you. When asked if you could imagine something...and you don't have to because you can remember it. The Scots accent is the only one I can understand. Oh, probably the gray in my hair but at least I have a full head of hair and ain't a chrome dome! Some say that I'm wise in my ways but I'm not too sure about that! My use of old fashioned phrases .... and my rare use of a cell phone. The circles when you cut a limb off.. It ain't no secret! White hair is your first clue. Be liking some Pink Floyd...Wait, doesn't everybody like Pink Floyd? Ha! I heartily dislike poor english. 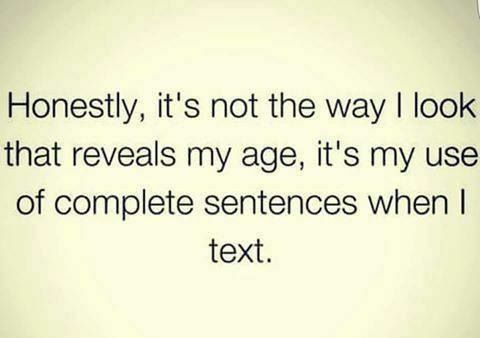 Well, about the only people I text are old, except my sons and they already know I'm old!